In my quest to go to and find interesting place I often miss the little towns that don't seem to have anything super interesting to offer other then the town itself. I often forget that not everyone is like me as I love ancient archeology as well as touristy places so that is my goal when looking for places to go to in Italy. However along the way I may discover many gems in the countryside that many others may really enjoy for its quaintness its overall feel and relaxed setting. Isola Del Liri is a small town located about 70 to 80 miles south east of Rome and depending on the route you drive will take about an hour and 30 to 45 minutes to get there. This make it a great place to take a day trip from Rome if you get tired of the big city. What makes this town a place to visit is its setting as most of the town has a river snaking all around it and the river splits and wraps around a good part of the town. The highlight of the town is its two waterfalls as it is a magnificent setting to see the water falling right next to buildings. It is quite interesting as the river comes into the town and splits off in different directions as waterfalls on both sides of the split. The waterfall has two distinct looks to it as one side falls of straight and the other side has a cascading look to it and from what I read that side had been modified so the town could use the falls for industrial purposes. This is also why many of the buildings on that portion of the falls has a distinctive industrial look to them. 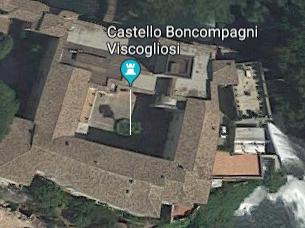 Things to do in the town besides looking at the water fall are visiting Boncompagni castle which is located right next to the biggest of the two waterfalls. The castle was originally built in the 12th century as an fort to protect the area, then much later was purchased by a wealthy family and turned into their home. Now it is one of the sites to see as it still appears the same way it did a few hundred years ago. Right next door to the castle is the church San Lorenzo Martire which like so many churches in Italy has many statures and painting adorning the walls. A beautiful church to visit while you are in town. Like other towns in Italy Isola Del Liri is a walking town and it is easier to park your car on the outskirts of town and walk everywhere you want to go. The main street in town is Via Giuseppe Verdi, here is where you will find shops to look through and is also where most of the towns 12 restaurants are located. There are restaurants in other places in town but as I mentioned most of them are on Via Giuseppe Verdi. Along with the many full restaurants there are several pizza shops as well as several pubs in town. Besides the waterfalls the second thing the town is well known for is its annual Liri blues festival which is the second largest in Italy. The festival is held every July and for one weekend the town comes alive with musicians not just from Italy but from around the world. In closing if you are interested in getting away from the crowded touristy places or love to be in and just relax in an interesting place with a wonderful view Isola Del Liri is one of the places to go.